Last week was very exciting for PodWorx. While we’ve been doing Live Streaming Video productions for awhile now, at 6:30PM Pacific last Wednesday, we produced our first pay-per-view event! 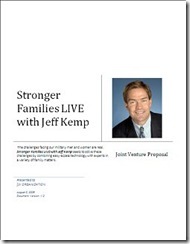 The show (which is ongoing. . .we have another broadcast coming up on Thursday) is called Stronger Families LIVE with Jeff Kemp. It’s hosted by the ex-NFL quarterback and features an interview with an expert in family matters, followed by a live question and answer session between our guest and the live audience. 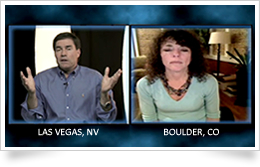 One of the most challenging aspects of Stronger Families LIVE (SFL) was attracting great guests to a live streaming video production that was completely unproven. We knew it would be a great show. We needed to help others discover that fact. Stronger Families the organization had never done anything like this before. So, to establish credibility where there was none to demonstrate, our first step was to write a Joint Venture Proposal that resonated with these potential partners. We covered many things in the proposal, to be sure. We were especially interested in explaining the problems we were going to solve using this form of broadcasting and the benefits to the partner. In our research, we knew that extending a partner’s brand awareness, providing access to an untapped audience, participation in this new broadcasting method, adding additional revenue to their bottom line and no need to travel would be interesting. To date, 100% of the people we’ve approached have accepted our offer. 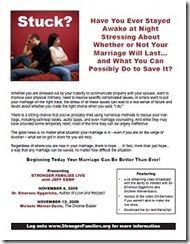 Besides a strong JV Proposal, we needed to craft an Effective Sales Page that would help potential audience members discover how SFL could assist those seeking help with their marriage. The sales page featured a natural, unscripted video by Jeff Kemp and was followed by a sales letter written from Jeff’s perspective. It described the problems folks may be having in their marriage, what they’ve likely tried to do to make things better, and ended with our solution. Towards the bottom of the page, we made it very easy (AND OBVIOUS) how to sign up for the show. Having a great sales page is one thing, but if nobody shows up, what good is it? To drive traffic, we relied on several online marketing techniques, but our biggest push came via E-Mail Marketing. We crafted a series of emails that were sent out at specific intervals to introduce people to SFL. Our goal for the email was not to explain how great SFL would be. Instead, our goal was to create curiosity. From a sales perspective, a curious prospect will engage, a non-curious prospective will not. So, the tenor of our email was quick credibility establishment + curiosity creation. Stronger Families also did a GREAT job in highlighting SFL on their Home Page. They created two different areas that feature graphics meant to drive visitors to their sales page. They also created a series of web banners and flyers for their partners to use as additional sales/marketing content. After bringing together all the audio and visual content needed for the show, we practiced, practiced, practiced. This was a bit of a challenge because Jeff was not able to rehearse AT ALL until the day of the shoot. Nonetheless, we used stand-ins for both Jeff and our first Skype-based guest and rehearsed our opening, guest introduction, question and answer session, and show close. We spent hours ensuring we knew our cues, sound levels, camera angles, and chat participation methodology to ensure that when Jeff (and Stronger Families biz dev manager Noel Meador) arrived in Las Vegas, we were going to be able to focus our attention on coaching Jeff and Noel (Noel was our conduit between the chat room audience and Jeff). They were VERY IMPRESSED with the level of professionalism we displayed. . .this was no accident. The design allowed the audience to see the live video and their chat room on one screen. There was ZERO advertising, ZERO popups, ZERO distractions. Equally important, the quality of the streaming video was outstanding. We use a robust Content Delivery Network that has over 20+ points of presence in two continents. The lag time between live and stream was about 3 seconds. The video clarity was great, as was the sound. As you can see from the video above, it looked great. When our special guest was introduced, we used directorial techniques found in broadcast television (transitions, two-shots, lower thirds, etc.). To be honest, this is always a concern. I’ve done live streaming video productions where audience participation has been very high and almost non-existent. The good news is, for SFL, we were overwhelmed by questions from the audience! 1. GREAT CONTENT: Jeff and our special guest did a great job in delivering content that people wanted to engage with. 2. PROMOTION: We made it clear in our advertising that one of the big benefits to attending SFL was to have the opportunity to ask questions. This is an opportunity that is usually not available to the guests we booked. 3. REMINDER: I had set up a reminder prompt within the chat room to periodically send a global message in the chat room on how to ask a question. 4. PARTICIPATION: Noel, from Stronger Families, was an active participant in the chat room, acknowledging questions, interacting with those in the chat, and providing direction. A final thought – another big bonus to our audience—one that we highlighted in our sales copy—was that they didn’t need to attend the live show to benefit from its content. A video-on-demand version of all Stronger Families LIVE episodes are being made available soon after each show is completed. We believe this was a strong motivator as well. Have you thought about developing a live streaming video production? If so, I hope these tips are helpful to you, regardless of whether it’s a pay-per-view or no-cost production. I’d be interested in hearing what others have done to create a successful show as well. Let me know! While the sales page mentioned above was written to highlight two LIVE episodes, Stronger Families is STILL getting paid signups for the video on demand now available. This is extraordinary! Copyright © 2006-2019 PodWorx, Inc., Las Vegas, Nevada | Designed, Developed and Deployed by PodWorx as well.